I made this tiny USB Digital Audio Converter device because I needed something to replace the horrible DAC/headphone amp in my 2008 Macbook Pro. 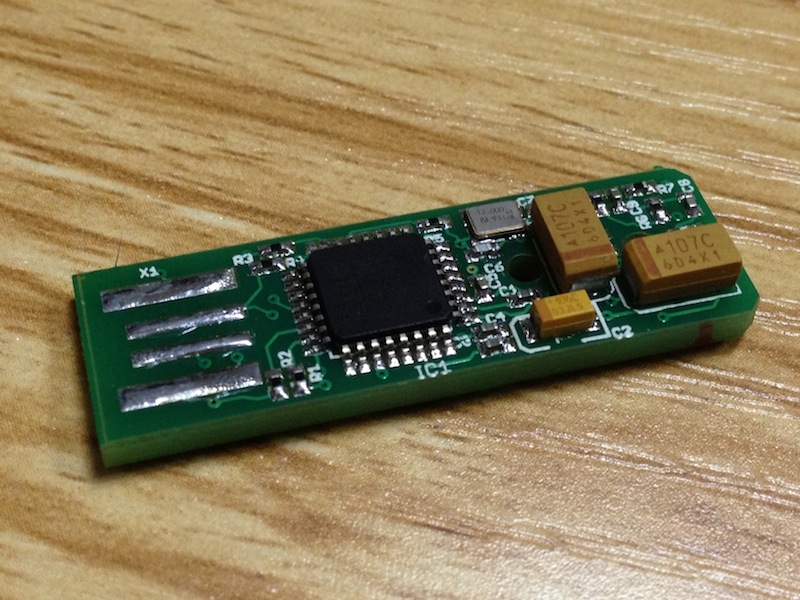 I wanted it to be as small as possible, and I had recently seen a kit based on the TI PCM2706 chip. The chip is rather old, but full featured and proven. I ordered a few and whipped up this tiny circuit board. I used a USB connector footprint that allowed me to plug the board directly into a USB port without the bulk of a physical connector. To save space, I mounted the 3.5mm jack on the underside of the board. It ended up fitting perfectly. It works almost as well - I haven’t tested the THD, but both channels sound much better than my laptop’s built-in DAC, with a significantly lower noise floor. One channel has a very slight low-end distortion that is evident when panning a signal back and forth. I still have a lot to learn about circuit design for analog signals, and I hope to revisit the project soon.